It's that time of year again! Time to decorate for Christmas. I was trying to think of a way to decorate the coops this year and I wanted to do it in a 'waterproof' way. It seems like all my outdoor decorations quickly become waterlogged, so I needed something that can withstand the snowy winters here. This was on my mind hours later when I was standing in the garage looking at the different chicken supplies and I spied the stack of feed bags I was going to turn into totes "eventually". I decided to make some Christmas stockings. 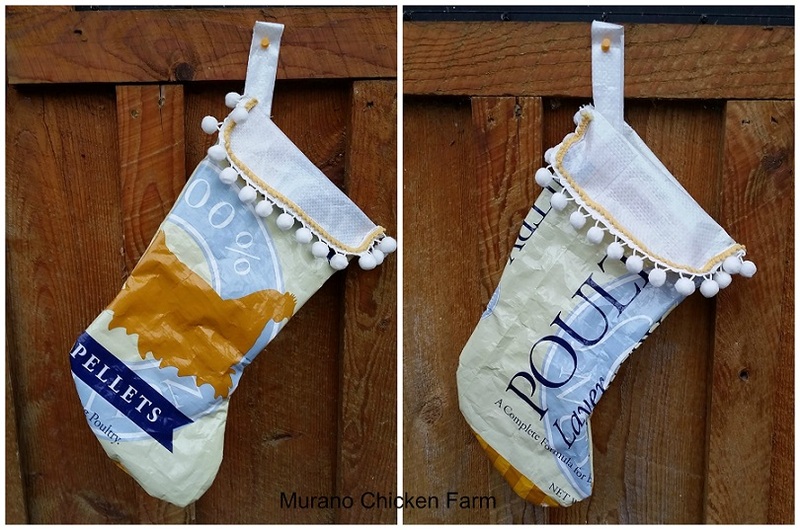 Since I was already using this free McCalls pattern for another project it was easy enough to make a few stockings out of a feed bag. You can do this 1 of 2 ways. Either print out the pattern, or simply use a stocking that is the same size as the stocking you want to make. For the sake of simplicity I decided to post the pictures using a tracing method. 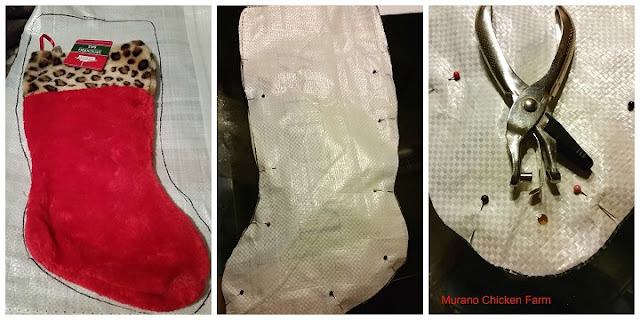 (...and as, I had one on hand....I also didn't want to explain enlarging and printing patterns, it's a pain the first time lol) I did 1 stocking using each method and as you can see...they turned out about the same. 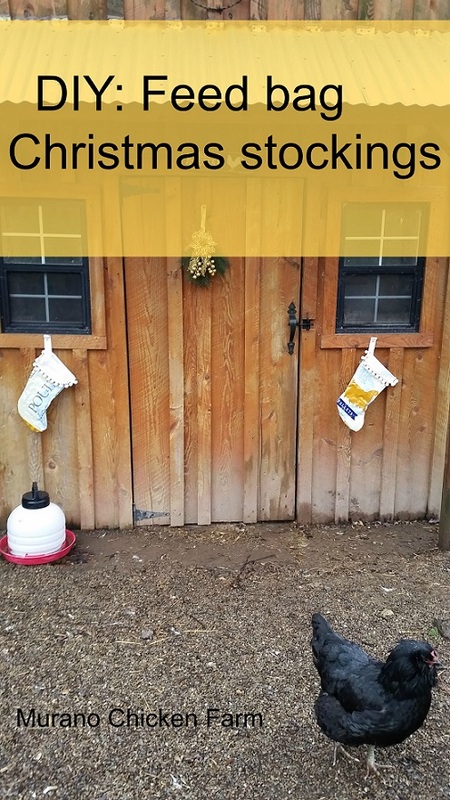 Do the same exact thing, centering the stocking on top of the image you want. Now flip the stocking over and cut 2 more pieces, these will be the backs so anywhere on the bag is fine. Pin the stockings inside out. The top pin should be at that line you put at the top of the cuff. Trim so that edges are even. If you're going to use these outside, use a hole punch to punch a hole in the toe of the back piece of each stocking. This is to allow for water drainage. I would hate to see the stocking rip because snow melted inside it and couldn't get out! You're going to sew a straight stitch around the stocking, starting at one of the cuff lines that you made and going around to the one on the other side. Then flip the stocking right side out. Now take the strip that comes on the top of the feed bag (the one you rip off to open the bag) and cut it into 2 equal length pieces. Sew each half from end to end using a straight stitch. Holding the cuff down, fold one of these strips in half again to form a loop and sew it to the top inside of the cuff. Now grab your glue gun and decorate that baby! I used 2 types of trim, layering the smaller one on top of the larger one. You can add whatever you want....I was eyeballing some fake fur, but couldn't find an affordable remnant. Maybe next time. These turned out so cute I just might need to make one for the dog out of his food bag too! If you're still in a crafty mood ... make these ornaments out of chicken feathers. Ok...so after I was almost done writing this I decide to use google to find a feed bag tote pattern to link to....just in case someone wants to make more feed bag projects. Well, I found out that I don't have an original idea here! lol Not even close! I found that not only has it been done a few times before, but also if you don't want to make your own you can buy them for $15 each at Etsy!!! Holy mark up...I think I spent $1 and an hour of time on 2! Anyway, after I spent the time and effort making and writing it, I'm 2 clicks away from posting it so here it is. *sigh* Note to self: research FIRST next time! This is such a neat idea! Thanks for sharing on Homestead Blog Hop. What a fabulous idea for outdoor decorating! We love the feed sack totes we made and posted about earlier in the year. They come in handy for so many things! Thank you for sharing on this week's Maple Hill Hop! What a cute idea. I too have a stack of feed sacks lying around waiting to be made into tote bags. :-) Thank you for sharing this on the HomeAcre Hop; I hope you'll join us again on Thursday. Thanks!....and thanks for the pin! 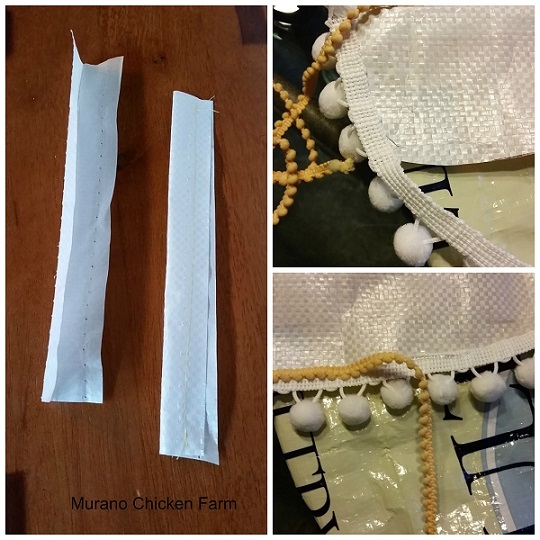 My friends and I were just talking about feed bags last week at our sewing get together. Apparently women used to pick out feed bags that they liked the color and patterns on so they could make things out of them. This was all new to me. 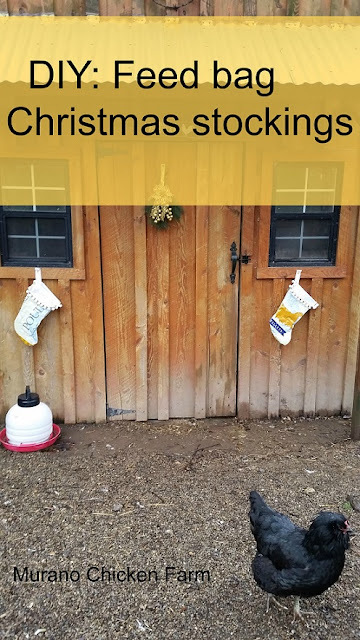 Cute socks, hope the chickens enjoy them. So cute! Thanks for sharing on The HomeAcre Hop! I'm featuring your post today! I'm glad that you like them! Thanks for the feature!